The hosting service I use went down just as I was getting this ready ready to publish. When it still wasn’t back by 4:30 this morning, I gave up and went to bed. Which means they probably got it back online by 4:35. Barring any more disruptions, we’ll be back at the usual time tomorrow. The LAPD has already reached a new height — or maybe low — in victim shaming under new chief Michael Moore. Under a new insurance company-sponsored initiative , the department will distribute 1,200 hi-viz reflective vests and clip-on lights to people stopped for jaywalking. Because, as we all know, it’s far better to make regular people dress up like clowns than actually expect drivers to slow down like the law requires and look away from their smartphones long enough to see what the hell is in the road in front of them. Or, you know, actually build an adequate number of safe crosswalks so people don’t have to cross without one, or anything. Thanks to Keith Johnson for the link. A road raging driver in Mexico City was injured — along with his intended victim, a restaurant hostess and two diners at an open air cafe — when he used his truck as a weapon in a attempt to run down a bike rider. After arguing with a man on a bike, he slammed his pickup into reverse, striking the bike rider, then smashed into a parked car. Both vehicles appear to have crashed into the restaurant before coming to rest against a tree. Let’s hope Mexican authorities charge the driver with four counts of attempted murder. And don’t write this off as just another crash. Note: If you don’t read Spanish, you’ll have to translate the link, like I did. Thanks to Frank Lehnerz for the heads-up. Twenty-one year old former junior cyclocross star Gavin Haley is making a name for himself as a musician as he tours the Golden State. 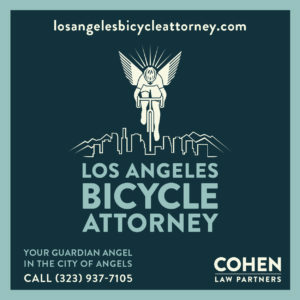 It’s Day 7 of the 4th Annual BikinginLA Holiday Fund Drive. 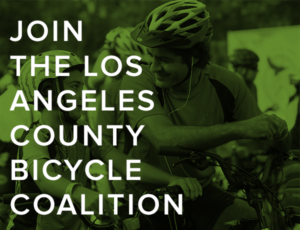 Your generosity helps keep SoCal’s best source for bike news and advocacy coming your way every day, from around the corner and around the world. Anything you can give helps. And is truly and deeply appreciated. LA County is studying how to create harmony between e-scooters, bikeshare bikes, cars and pedestrians in unincorporated communities and county roads. It looks like a new bike lane is coming to Stewart Street in Santa Monica. Pomona residents recommend separated bike lanes and a shared bike and pedestrian path to improve access to a proposed Gold Line Metro station — if it’s ever built. A Contra Costa County judge has blocked bike access through an East Bay country club, denying riders a long-time bypass route to avoid a dangerous roadway. New parking protected bike lanes in Sacramento are filling up with wet, slippery leaves that can pose a risk to the riders using them. The bighearted people at a Nevada County bicycle recycling project have donated 30 rebuilt bikes to victims of Northern California’s Camp Fire. CNET says e-scooters could be sending as many as one thousand people to the ER every month, based on figures they apparently just made up. Colorado’s playground for the rich and famous is trying to get ahead of the curve by writing regulations for e-scooters, even though no one’s offered to put them there yet. 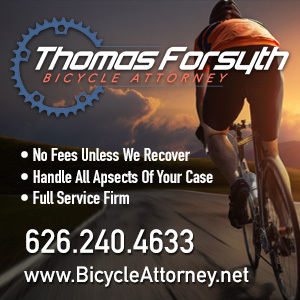 What’s left of a Texas family has filed a $1 million lawsuit against the speeding, out-of-control driver who killed their wife and mother as she was participating in a randonneuring event. Naturally, the driver claims the sun was in his eyes. Which doesn’t explain why his foot was on the gas pedal. When is an ebike not a bicycle? Evidently, when you’re in Ohio’s Amish Country, where people seem to be freaking out about them. New York food delivery riders are organizing to fight for healthcare after one of the workers died from an untreated ulcer. After New York councilmembers call for legalizing ebikes and e-scooters, Streetsblog says the city’s mayor, who opposes the measure, is blind to the real dangers on the streets. And it ain’t the people on two wheels, battery powered or otherwise. Apparently, a New Jersey community has a lot of kindhearted cops. After a Roxbury police officer bought a man a used bike as he watched him commute in all kinds of weather on a rusted bike, he bought him a new one after that one wore out. Only to learn that the man’s original bike had been a gift from another officer. Bicycling says a close-knit cycling community is in mourning, following the crash that killed two Florida bike riders. A 415-pound Puerto Rican man took up bicycling to lose 20 pounds, and ended up riding 27,000 miles and losing 167 pounds. And quit smoking, too. Turns out even the best air pollution masks filter out less than half of the particles they’re exposed to. Which doesn’t sound much better than tying a bandana around your face. Forbes says cargo bikes, not drones, are the future of delivery. A Quebec letter writer says laws requiring drivers to use snow tires in the winter are ineffective. So we should extend them to bike riders, too. You just can’t please some people. Montreal-area drivers are complaining that a new separated bike path is impeding traffic on the nearby roadway, even though officials didn’t actually remove any traffic lanes or reduce capacity to make room for it. No bias here. Over a thousand tickets were issued to London motorists for distracted driving or not having insurance during a two-week crackdown on dangerous driving. Yet somehow, the headline was about the 519 bike riders who got tickets, too. No bias here, either. A study commissioned by a pressure group dedicated to the removal of one of London’s cycle superhighways has found that it’s costing businesses the equivalent of $6.8 million a year. Even though no other study has found that it even causes traffic congestion, let alone huge loses due to it. They get it. Over two-thirds of the residents of Perth, Scotland call for improving safety for bicyclists by installing protected bike lanes, even if that means less space for drivers. Here’s another one to add to your bike bucket list — a fondo in sunny Saint-Tropez. Unless you’d rather ride on the riverfront bike paths of Taipei. A new Swiss study shows that switching to an active commute can help you lose weight, but says it isn’t clear if that applies to ebikes, as well. But a Norwegian study shows ebike riders exert almost as much energy as regular bike riders. Life is cheap in Australia, where a drunk, speeding teenager who was driving without a license got just 25 months for killing a man as he was riding his bicycle. A former Australian football great was injured when he was hit by a driver while riding his bike; fortunately, his injuries weren’t serious. 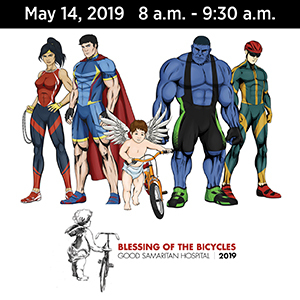 South African pro cyclist Willie Smit donated the equivalent of over $43,000 in bicycles and equipment to a Cape Town cycling academy dedicated to serving underprivileged kids. Former Giro Rosa winner Mara Abbot tells her own story of how even the best roadies can make the worst mountain bikers. Tres shock! Bike riders sometimes look at billboards and pretty people. When in Amsterdam, do like the Dutch and watch out for bikes. And your next bike helmet could help prevent concussions, and call for help if it doesn’t.